For decades, waterfowler hunters have been trying to get back to traditional lead levels of performance. Steel isn't remotely close. Many tungsten loads are, but consumers are not always willing to pay the price of true lead-like performance. Bismuth is much more affordable than tungsten and can be used with lead-only barrels and chokes. Kent has changed that, with bismuth loads available in larger shot sizes. This is a look at 50 yard performance, lead compared to the latest Kent loads. For pass-shooting mallards, #4 lead was considered to be the best. The Kent #3 Bismuth is not quite up to the 50 yard penetation level of #4 lead, but it is close. It is in the middle between #4 and #5 lead: roughly #4-1/2 lead shot performance. The grand old standard for large geese has always been #2 lead. Bismuth BB shot handily exceeds #2 lead assuming 1-1/2 oz. payloads for each, at the expense of a drastic decrease in pellet count: 87 pellets vs. 131. Kent's Bismuth #2 is 150 pellets, better than #2 lead, but the 50 yard penetration is comparatively weak, at 2.05 inches vs. the 2.64 inches of #2 lead. "B" sized Bismuth would be ideal, but Kent offers nothing between #2 and BB bismuth at this time. 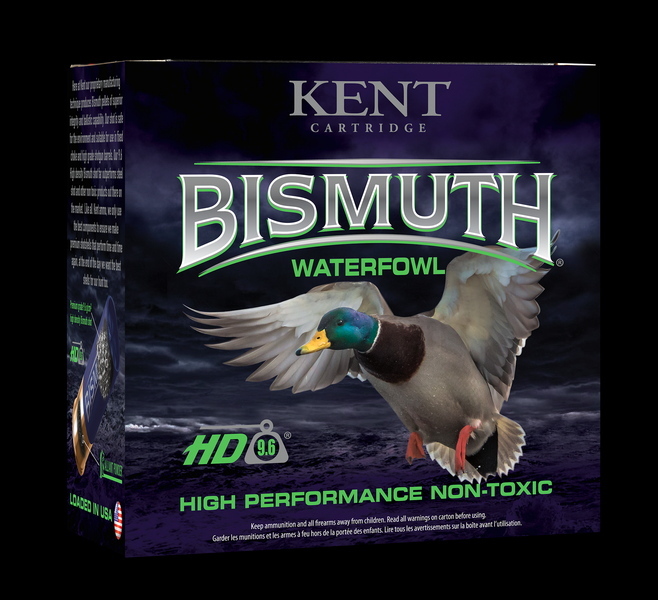 For wild pheasant and mallards at moderate to long ranges, Kent #3 Bismuth is the answer. For large geese, Kent #2 Bismuth is likely the best compromise. Certainly, BB bismuth is a far longer range load, but the skimpy pellet count holds it back. Note, however, that BBB steel is only 61 pellets to the ounce and even 3-1/2 12 gauge steel shotshells most often have 1-3/8 oz. payloads. With some careful choking, we will see what can be done. These two loads, Kent B123W42-BB and Kent B123W42-3 are on their way, so we will see how they perform. While we are on the general topic, let's look at the popular #2 steel duck load vs. #5 lead vs. #3 bismuth. Steel in #2 really stinks it up compared to #5 lead, with substantially less penetration and a lower pellet count as well with a 1-1/4 oz. payload. Bismuth #3, however, actually outpenetrates #5 lead and with the 1-3/8 oz. load as offered by Kent, betters the pellet count of the common 1-1/4 oz. #2 steel load as well. The low density of steel means that it can really never be an excellent long range duck or pheasant load: it cannot compete with lead and it doesn't. Bismuth does indeed fare quite well in comparison to lead, as long as you go 1-1/2 to 2 notches larger in pellet size. Steel, even 3 shot sizes larger than lead, does not do well at all. Numerous studies suggest that 5 - 6 shells are expended for every mallard bagged and about the same number of shots for dove. It should make you wonder why folks are excessively worried about ammunition cost when it is often so poorly used. While no shotshell makes you a better shot and no choke tube can do that either, the typical hunter of 2018 using steel (actually soft iron) has a lot less to work with the hunters of the 1980s. Wounding losses are inevitable, as the use of steel first mandated in 1991 has only has the effect of reducing effective range and making the 28 gauge, 20 gauge, and 16 gauges impractical for many applications. With bismuth, you surely do not need or want a 3-1/2 inch 12 gauge. To struggle to get to #5 lead levels of performance, you need to go up three sizes of shot, to #2. With bismuth, that is still less dense than lead (9.6 g/cc vs. 11.3 g/cc) you still need to go up in shot size to get lead level performance, but about 1.5 sizes instead of three. As for price, a 25 round box of Kent 1-3/8 oz. 3 inch 12 gauge #3 1450 fps round runs $40 or a tad less. The excellent Kent Tungsten-Matrix loads run about $37, but those are for boxes of 10. Bismuth loads are less than half the price, about $1.60 a shell. It isn't like buffered lead loads are free, nor are premium steel loads: they can be about a dollar a shell. While turkey hunters will pay $4, $5, or $6 a shell for tungsten, waterfowlers rarely will. Right now, bismuth is the best thing going for lead performance levels without nose-bleed prices. In addition, bismuth is good for essentially all shotguns and chokes. Your old Belgium A-5 that you cannot (or shouldn't) use steel in is once again ready for the hunt with bismuth and at a performance level that steel shotshells cannot begin to match.While dentists might prefer you use steel, bismuth is not excessively hard and does not rust. Bismuth has just made the 3-1/2 inch 12 gauge obsolete.